The Ratite family includes birds which cannot fly. Their breastbone is flat, with no keel. The keel of a bird’s breastbone is where the flight muscles connect to their skeleton. Without this keel, ratites could not fly even if they had suitable wings. The ratites’ strongest muscles are in their legs and thighs. There are only 5 types of ratite in the world. They are the Cassowaries, the Emu, the Ostrich, the Rheas and the Kiwis, making a total of 12 species in all. The biggest ever birds are also Ratites – the Giant Moa is the tallest ever bird, a Ratite from New Zealand, and the Elephant Bird, a ratite from Madagascar, is the heaviest ever bird. The Moas and the Elephant Bird died out after people arrived on their islands. The African Ostrich is the biggest living ratite, in fact, it’s the biggest living bird of all. They are nearly 3 metres (9.8 feet) tall. They weigh about 160 kilogram (350 lb). With their powerful legs, they can run faster than a horse. Ostiches have only two toes with one bigger than the other one. They have wings but they cannot fly. They have the a very long longest gut, 15 metres (46 feet) long! They eat mainly plants. The Australian Emu is the second tallest ratite after the ostrich. It can reach up to 2 metres (6.6 feet). It is about 60 kilograms (130lb). It can run fast like the ostrich. It lives on open grasslands and woodlands. It has a more omnivorous diet compared with other ratites, since it also eats insects and other small animals, besides plants. 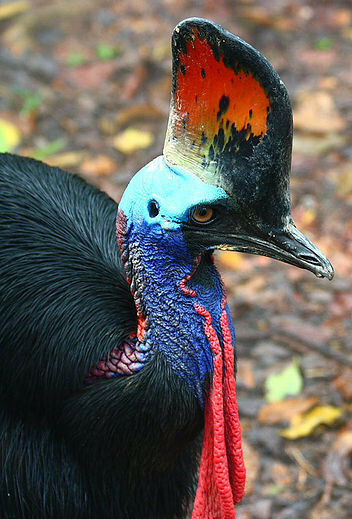 Next there are the 3 species of Cassowary, which are native to Australia and the islands to the north. They are shorter than emus but heavier and more solidly built. They prefer to live in thick tropical forests. You have to be careful when you bump into them because they have razor sharp claws, and a hard growth on top of their head. In South America, there are 2 species of rhea. They are of medium-sized, fast-running birds. They live in the South American lowlands, The larger American rhea grows to about 1.5 metres (4.9 feet) tall. They weigh about 20 to 25 kilograms (44-55 lb). They have wings but they do not use them to fly. Instead, they use them to distract their predators. They eat mainly plants and sometimes insects if they can catch any. They feed on broad-leafed plants. 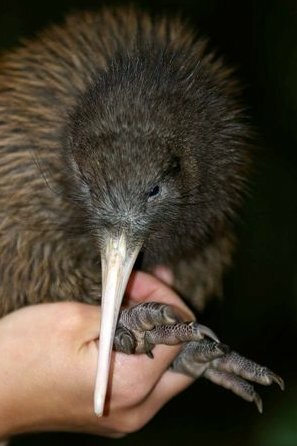 The smallest ratites are the 5 species of kiwis which are native to New Zealand. Kiwis are only about the size of a chicken. They are shy and are active at night. They have good sense of hearing and smell. They are the only birds with nostrils at the end of their long beak. They are good in seeing at night too. They make their nest in deep burrows and they find small insects and grubs in the soil for food. Their eggs are very big, compared with their body size. The smallest species of kiwi is the Little Spotted Kiwi which is only 1.2 kilograms (2.6lb) and 40 centimetres (16 inches) tall. Kiwis have the shortest tracts. They eat seeds, fruits, small crayfish, earthworms and insects. Ratites’ babies are able to run or walk soon after birth. Most ratites share a common nest. They even share the job of keeping the eggs warm, with the male keeping them warm at night. So, the father will does the night shift of taking care of his babies! Ostriches are the only ratites where the female incubates the eggs. Kiwis are the only ratites which have only one mate at any one time. Ratites’ eggs have been used by humans as water containers, jewellery or other art and craft. Male ostriches’ feathers were used to make hats during the 18th century. Therefore lots of ostriches were been hunted and there were a sharp drop in the population of ostriches during that time. This event has led to the beginning of ostrich farming. Ostriches are harvested for their feathers, hides, eggs and meat. Emus are popular for their emu oil and also their meat, eggs and feathers. Rhea’s feathers are popular for dusters and eggs and meat for chickens and pet food in South America. Ratite’s hides are used to make leather goods like shoes.